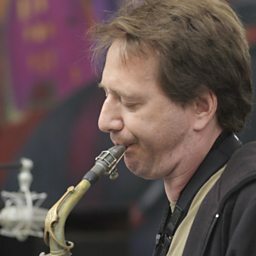 Masada is a musical group with rotating personnel led by American saxophonist and composer John Zorn since the early 1990s. Masada is as much a "songbook" as a group, comprising more than 500 relatively brief compositions. Each song is written in accordance with a number of rules, including the maximum number of staves, the modes or scales that are used, and the fact that the songs must be playable by any small group of instruments. Given the historical associations of the project's name (see Masada), the Hebrew titles of the compositions, and the Jewish imagery on the covers of the associated albums, Zorn was clearly exploring his Jewish roots, stating, "The idea with Masada is to produce a sort of radical Jewish music, a new Jewish music which is not the traditional one in a different arrangement, but music for the Jews of today. The idea is to put Ornette Coleman and the Jewish scales together."